Johnny Doyle believes Jim Gavin’s greatest achievement as Dublin manager is more intangible than their on-field dominance. GIVEN ITS FACILE nature, Dublin’s victory over Tyrone wasn’t met with unadulterated joy but more a quiet satisfaction – from the players at least – as Jim Gavin’s men strolled to their third consecutive All-Ireland final, and a fourth in five years. Indeed, the game’s climax struck as more poignant than jubilant, as a devastated Seán Cavanagh came to terms with what would be his final ever inter-county game, a hard-hitting realisation which understandably produced waterworks – and not merely from the Omagh man. Having departed his children and wife Fionnuala in the stands, as well as hordes of handshakers and admirers – one of them former team-mate Brian Dooher – Cavanagh’s return to the field following the final whistle garnered similarly emotional embraces, with each Dublin player footslogging towards the sideline to pay their respects to the three-time All-Ireland winner. 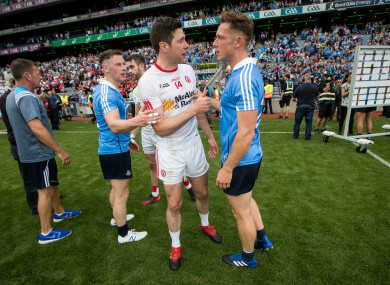 An exchange with fellow elder statesman Stephen Cluxton was especially affecting, the Dublin ‘keeper rubbing ears with one of the few remaining players with whom he came up, and a man who had contributed to laying waste to his own dreams in both 2005 and 2008. Doyle continued: “They epitomised it at the end of the game; there was no jumping around. It was over to respect one of the greats of the game [Sean Cavanagh]. That’s not rehearsed. That’s not, ‘Oh, we better do this now or Jim Gavin will be having a go.’ That’s just a mark of respect; yes, they’ll take the head off him on the field, but as soon as the game was over, most important was, ‘We’ll see this guy off. He’s been an unbelievable servant’ – to the game, really, not only in Tyrone. Indeed, Doyle is of the opinion that Dublin’s collective modesty is one of their greatest assets. On a day in which the forward line Gavin opted to hold in reserve could conceivably have been considered at least equal to that which tore Tyrone asunder in Croke Park, Doyle felt Gavin’s charges exuded a lesser-spotted togetherness which speaks to the very concept of ‘team’, and one which has seen them reap reward as a collective more so than a starting XV. “That humility,” he said, “we hear about it in the All Blacks and any team that are successful. But it’s one thing talking about it, and it’s another thing [to do it]… Because we all want to play. “I’m sure Bernard Brogan wants that jersey as much now as he ever did. But to be able to buy into it – ‘Well, look it, I’m sitting here, and when I’m called I’ll go on and do my very best, and if I’m not, what can I do?’ – and not get vexed by it, it’s very, very difficult to create that. Jim Gavin has done a phenomenal job in that alone, regardless of the success. And that, to me, has been the big secret of his success with Dublin. Email “'We hear about it in the All Blacks... That, to me, has been the big secret of Gavin's success with Dublin'”. Feedback on “'We hear about it in the All Blacks... That, to me, has been the big secret of Gavin's success with Dublin'”.